W-Tool-QC "Quick-Change" » Protective Solutions, Inc. The W-Tool-QC "Quick Change" can be used as a 25lb. 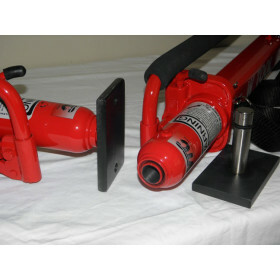 Battering-Ram when rapid intervention is required, or quickly converted into a Non-Destructive Forcible Entry Tool. The “QC” has a Quick-Change Head Assembly that allows the user to change the head of the tool for multiple rescue operations. With a simple twist, the W-Tool Head can be changed from a door breaching Flat Head to a Rescue V-Block or other Piercing, Cutting or Stabilization Head specially designed for the W-Tools. Head changes can be made quickly in the field with a Gloved Head and require “NO” safety pin removal or installation. All “QC” heads are 100% Solid Steel Construction and maintain the Weddle Tool Company Quality Standard being “Proudly Made in the USA”. The QC comes with the FLAT BREACHING HEAD, a shoulder carry strap and an integrated LED light for hands free night-illumination. The optional Quick-Change Heads and the Quick-Change Tip "Kit" are SOLD SEPERATELY. Select one of three colors, each with it's corresponding decals: Fire Red, Law Enforcement Black, and Rescue Blue.